Geographically, North America is the dominating market of smart agriculture and accounted for over 70.0% of global smart agriculture market in 2016. U.S. based companies have raised their investment up to 90% in agriculture based technologies which is the major factor for the growth of smart agriculture in the region. North America smart agriculture market is expected to reach value of USD 20.0 billion by the end of 2024. Inclination of U.S. farmers towards robotics and GPS technologies is likely to drive the smart agriculture market in North America region during the forecast period. In Asia-Pacific region, Japan is the dominating country in smart agriculture market. High adoption rate of precision farming is contributing the major portion in the total revenue of smart agriculture in Japan. In 2015, precision farming holds 30.0% market share of overall smart agriculture market in Japan. Asia-Pacific region will have addressable market for smart agriculture and is expected to reach a value over USD 10.0 billion by the end of 2024. Emerging economies such as China and India are also accepting digital technology in agriculture sector. Europe spends over 6.5 % of its GDP in food and agriculture sector which is creating positive market scope for implementation of digital technology in agriculture. Europe smart agriculture market valued USD 5.4 billion in 2016 and is anticipated to witness a notable growth at a CAGR of 7.48% over the forecast period. European countries such as Poland, France and Scotland have increased their trade value of food industry by implementing IoT based solutions in agriculture. Major area of Latin America region is covered with forest and natural resources which is driving the agriculture industry in the region. Rising penetration of automation in agriculture industry mainly in Brazil and Mexico is contributing for significant growth of smart agriculture in Latin America region. Changing climatic conditions majorly affect the agricultural production. Brazil has witness nearly 10-18% of reductions in production of soy and corn in past few years due to extreme heat conditions. Deployment of IoT based solutions can efficiently monitor the climatic changes and can improve the crop yielding. IoT based solutions also helps in effective utilization of water and its conservation in agriculture. Smart irrigation has potential to reduce the water consumption up to 10-15% which is anticipated to become a future for smart agriculture market. Moreover, advanced technologies for agriculture sector is also reducing the consumption of energy and enhancing the crop productivity. Farmers are inclining towards the adoption of smart equipments such as drones and GPS tracking which is improving the agricultural activities and reducing the operational cost and human labor. More than 85% of farmers are using GPS enabled technologies in farm machinery and livestock monitoring in US. These are some of the key factors which are driving the smart agriculture market globally. Lack of access to connected devices and services in agriculture mainly in developing countries is restraining the market growth of IoT in smart agriculture. Over 60% of farmers across the world are not facilitated proper internet connectivity. High initial investment in implementation of advance technologies is limiting the adoption of IoT among farmers of developing countries like India, Brazil and China. 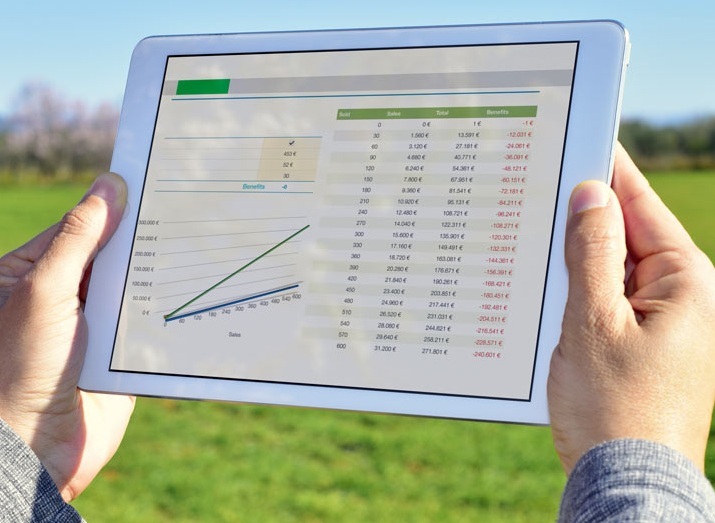 Agriculture industry has vast application and efficient management of data is a major obstacle for the expansion of smart agriculture market. Smart agriculture market is majorly consists of startups. Deployment of large scale projects in agriculture is a challenge which also reduces adoption rate of technologies by farmers in agriculture sector. Rising penetration of communication technologies is likely to raise the adoption of IoT based solutions in agricultures. More than 85% of farmers are using 2G/3G/4G connectivity technology in 2016. Wireless sensors and Bluetooth technology is expected to contribute in effective farm management. Rising acquisitions and partnerships between government and private companies is like to promote the investment in smart agriculture projects. For instance, USD 16.0 billion was invested by major tech giants in farm business network across the world in 2016. Moreover, European Union is investing over USD 100.0 billion for rural development of Europe region and enhancement of agricultural technology in the same year. Rising penetration of internet and Smartphone is drastically changing the market of smart agriculture. Educational Apps on farm management and new agricultural technologies is going to increase the wide adoption of smart agriculture across the world.